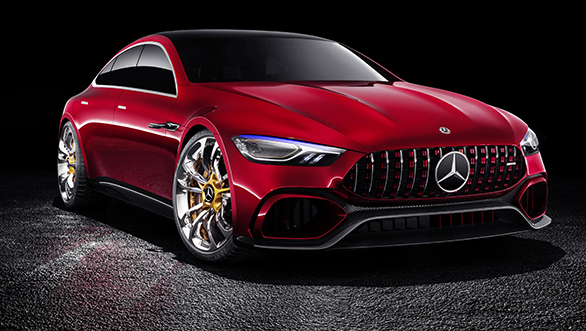 To celebrate its 50th anniversary, Mercedes-AMG has unveiled the GT Concept at the 2017 Geneva Motor Show. This is the first four-door variant in the AMG GT line-up and previews the technology and performance of the brands upcoming hypercar which will be unveiled in Frankfurt later this year. The highlight of this Mercedes-AMG GT Concept is its hybrid powertrain. It features a 4.0-litre twin-turbo V8 petrol unit that is linked with Mercedes' 4Matic all-wheel drive system and a high-performance electric motor that powers the rear wheels directly. Together, they will be able to produce up to 816PS of power. Mercedes-AMG also claims that the GT Concept will get from 0 to 100kmph in less than 3 seconds. The car will feature torque vectoring and balanced axle load distribution. Torque vectoring controls how much power is sent to each wheel for optimal grip, especially around corners. 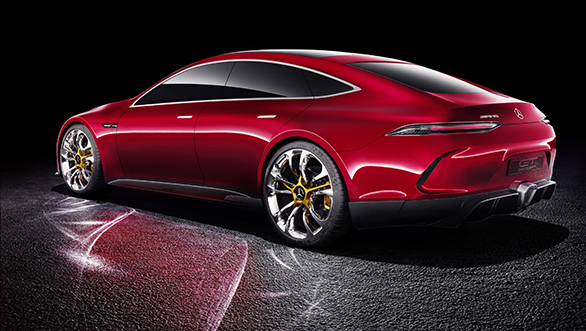 The Mercedes-AMG GT Concept is the second car, after the F1 car, to bear the EQ Power+ designation. This is the tag that all performance hybrids from the brand will have in the future. The electric powertrain's functioning is based on the technology used in Mercedes' F1 car with its batteries being charged while on the move. The brand says that the powertrain is more powerful than conventional units, and yet lighter and more compact. The car can also be driven solely via the electric motor or the combustion engine. The Mercedes-AMG GT Concept's design is quite unique from the other cars in the brand's line-up. It's more of a four-door performance fastback rather than a performance saloon. Its DRLs debut nano active fibre technology, which they haven't explained in detail. Its design theme is a mix between aggressive and elegant, thanks to the large curves as well as sporty grille and front bumpers.